As promised, I present my finished baby blanket. and simply finish with the rounds of granny. The pattern is Rectangular Sampler Blanket, and it works up to a decent sized baby/lap blanket. I was working it as part of Underground Crafter's CAL, but didn't finish in time for the contest, and was also impatient. My reason for stopping before the border was 1) because I knew if I didn't end it, I wouldn't finish and 2) I wanted to gift it ASAP. A friend of mine recently had a baby! and I wanted to give her something. It was spontaneous, hence the hurry to finish. I'm pleased with how it turned out, all happy & rainbow-y. About 1000 yards of yarn went into it, and the rounds were starting to get long. I think if I work the pattern again, which I'd like to do, I would have more planning, and try to keep the colors down to 2 or 3, like the pattern recommends. Linking with Tami for FO Friday!!! 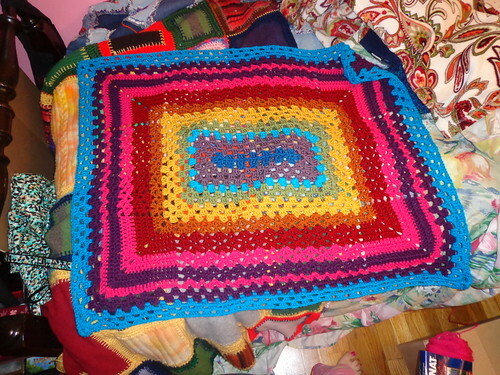 Very cheerful colors on the baby blanket. I love to give bright colors for baby things!